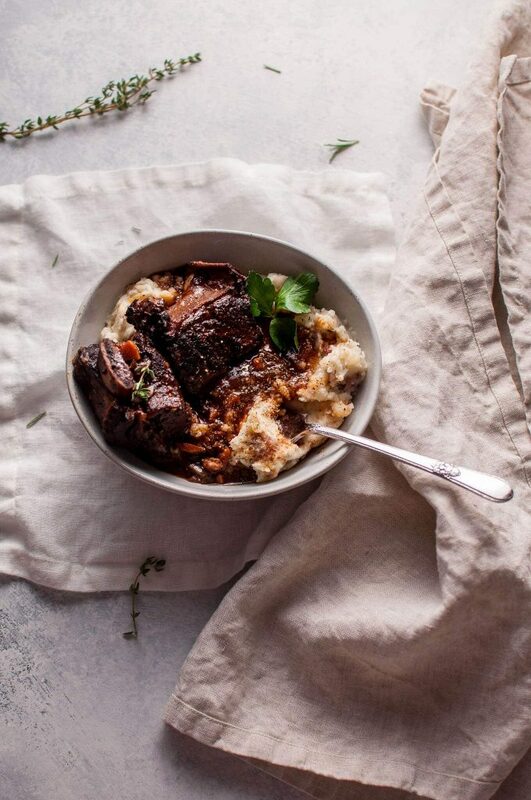 My Crockpot red wine braised short ribs are the ultimate cold weather comfort food! Don’t skip the searing step. Yes, it’s more work than throwing everything straight into your slow cooker, but it’s well worth it. This type of Crockpot recipe is ideal to prep on a lazy weekend morning. Spend some time chopping and searing then chuck the ingredients in your slow cooker. 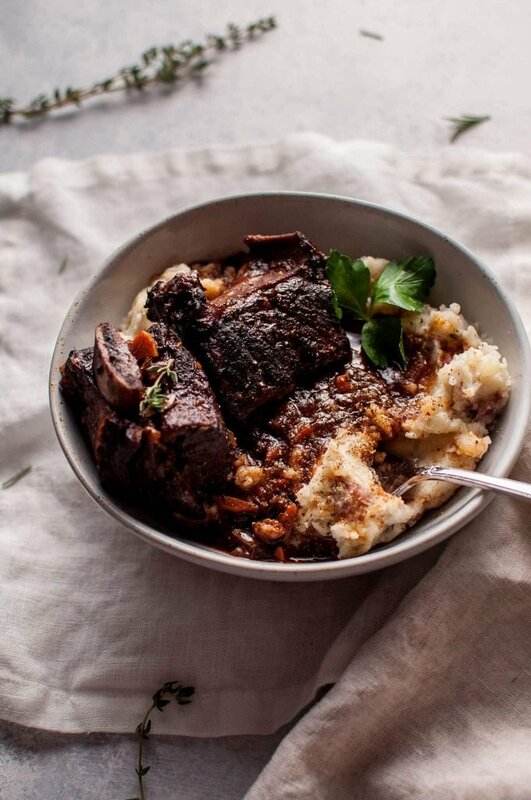 You’ll be rewarded with the wonderful aroma of these short ribs while they’re cooking. I was pressed for time, so I cooked the ones in the photos for 5 hours on high. They were nice and tender. 7-8 hours on low would make them even more tender. Once the ribs have cooked, all you need to do is skim the fat off the surface (you’d need to do this if you used any type of braising method e.g. Dutch oven), and serve them with or without mashed potatoes. The beauty of making recipes like this is that you will have leftovers you actually want to eat. It’s really not much work at all for 6+ servings. And that sauce is soo tasty! 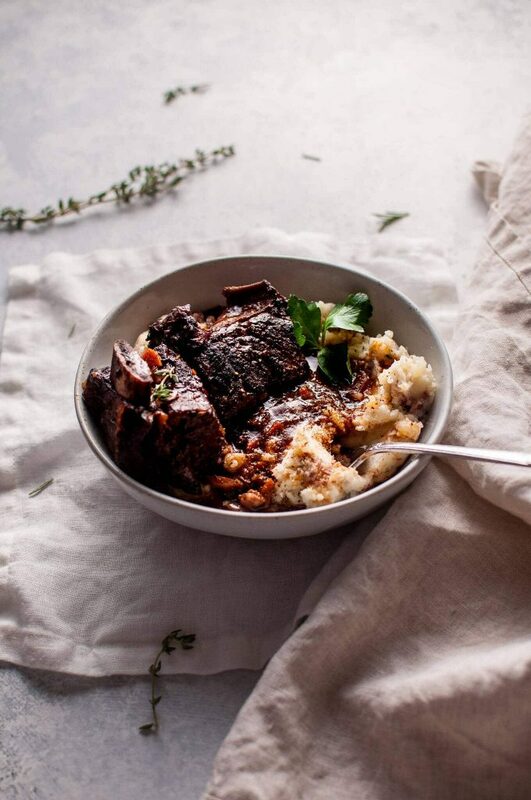 Hope you enjoy this slow cooker braised short ribs recipe! Add olive oil to a large, heavy skillet on medium heat. Season the short ribs with salt & pepper. Once the oil is hot, add the short ribs. You'll likely need to do two batches. Don't crowd the pan. Sear for 3-4 minutes per side. Add all the other ingredients to the Crockpot except for the cornstarch. Give it a stir. Add the short ribs in as even of a layer as possible (some will likely stick out and that's ok). Cook on high for 5-6 hours or low for 7-8 hours. Once the ribs are done, skim the fat off the surface (I just use a small spoon to do this). Mix the cornstarch with about a tablespoon of cold water until you've got a smooth mixture, then stir it into the Crockpot. Let it sit for about 5 minutes to thicken the sauce up a bit. Add extra salt & pepper if desired. Serve with mashed potatoes or other side dishes. Cook for 5-6 hours on high or 7-8 on low. I always suggest adding salt "to taste" because everyone's salt preference is subjective, but I did add more salt to this than I normally would to a dish, partially because there's a whole bottle of wine in there, and it does serve 6+ people. This dish freezes well. 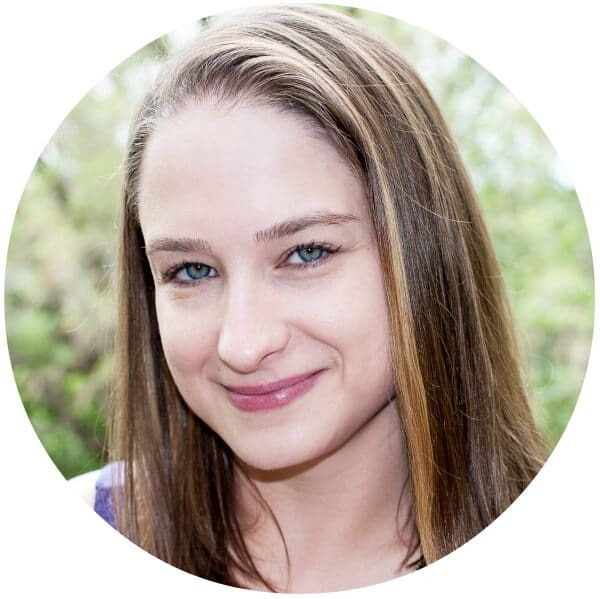 Braised short ribs is one of my favorite dishes Natasha! So comforting and perfect for a cold winter night! I’ll need to give your recipe a try! Thanks, Mary Ann!! I wish I had some left… it’s absolutely frigid out today! Just checked the slow cooker after 8 hours on low.. was very excited to give it a taste – as the short rib was nice and tender. Took a bite, ridiculously bland! Spoon tasted the mixture in the crockpot, oh my gosh it was close to inedible! Did you happen to skip any steps in your instructions? Did you need to reduce the wine first? Or forgot the beef broth? Followed your recipe to a T and used a very nice Pinot Noir (have used it before in making short ribs with no problem). Please advise – Its Valentine’s Day, and this was our planned dinner!! Hi Monica, did you skim the fat off the top, add in the cornstarch, and some extra salt? I just re-read the instructions and ingredients list a few times, and it all seems to reflect how I make them. I’m at work right now, but I will check my written recipe notes again as soon as I get home to see if it’s possible that I missed something. I’m really upset to read this – we really enjoyed the short ribs and I’m now wondering what went wrong here. I feel truly awful if in fact your Valentine’s Day dinner is ruined. Thanks for the reply. I added an extra spoon of brown sugar, and more salt and pepper – it’s slightly better. I’m going to add a cup of beef stock later this evening when I decide to reheat to salvage the dish. Please let me know if you find something useful in your notes that differs from your recipe above. Out of curiosity – what wine did you use for this and how much water did you mix in with your cornstarch? Hi Monica, just checked my notes, and they match up with the recipe posted here. I’ve made it with a cabernet sauvignon and a pinot noir before. I use approx. one tablespoon of cold water with the cornstarch. I’ll update the recipe to be more specific. If you don’t mind me asking, did you add the beef stock for additional flavor or because the dish was dry? I’ve seen some recipes for short ribs that use beef stock and some that don’t, so I’m very interested in hearing how it turned out. Added 1 cup of beef stock for flavor. Turned out fine in the end. I agree it seemed like a hell of a lot of salt to balance this dish – would be good to revisit this recipe and see how you can better balance it, or an initial amount of salt to begin with so the initial tasting isn’t as off-putting. I think this is why other recipes do have the cup or so of beef stock for flavor to balance the red wine, and also for it’s saltiness factor. Hi Monica, nope you didn’t miss it. I added it after considering your feedback and thinking about when I make the dish so I can point people in the right direction. I wouldn’t say I add a “hell of a lot of salt”, but thanks for your feedback re: the beef broth. For Christmas I received an All Clad all in one Browning 7 quart slow cooker …. After much research I chose salt and lavenders recipe. But after this review I was terrified it would be tasteless .. But this recipe is excellent … meat was perfect and the sauce was restaurant quality .. please don’t let the last review steer you away !! I am so happy to hear that this recipe worked out for you, Barbara, and I really appreciate you leaving a comment here. I think that reviewer’s issue was that she did not use enough salt and possibly wasn’t used to cooking with salt. Some recipes you need to add more than others, often more than you’d think. Bouillon is salty, so that would have played a part, I think. 🙂 Adding beef broth/stock like she mentioned is definitely an option too. Enjoy your new slow cooker! I had boneless short ribs in my freezer and decided today’s cold spring weather was just right for them as a Sunday dinner. I did make mistakes, and this still turned out great. I decided to cook the onion and carrot in the pan I used to sear the short ribs, so I could get the pan juices for flavor. I added a tiny bit more olive oil and some of the wine into the pan, then added the tomato paste, thinking it would be easier to mix it all together in the pan, and add the warm mix to the ribs in the slow cooker. As I started to stir it in, I realized I added the entire can of tomato paste! I scooped out most of it, then added a bit more carrot, onion and garlic, along with the spices, sugar and Worstechire sauce. I didn’t have thyme, so tossed in a sprig of rosemary. I also took note of the prompt to add more salt than usual, and did add some, but not much. At the end, I didn’t have cornstarch (aaagh! ), so I mixed a tablespoon of flour to a small bowl of the hot sauce and then added it back into the pot to finish cooking. Thank you for the easy recipe! The positive response to the meal made clear that my mistakes were not critical. So glad you liked it! And I’m so glad it turned out. I always improvise while cooking too… it usually works out hehe. And yes, my husband would definitely agree with you about cooking with the wine you drink – he taught me that trick. Delicious! I made this recipe tonight and it was a big hit. I bought an 8 pack of boneless beef short ribs from Costco. I browned them in a pan with olive oil, then sautéed vidiallia onion and garlic in the pan, transfered it to the slow cooler with 32ounces of organic beef broth and two cups of a Tuscan red wine, added the brown sugar, Worcester sauce, lots Italian seasoning dry mustard and celery salt. It was delicious. Thank you for this fantastic recipe!! So happy you enjoyed it, Susan! Thank you for the recipe. Just wondering some small details before I try it. Any recommendations on a name of red wine specifically that you have made this recipe with? Also, dark or light brown sugar and if it is dark is it packed in the tablespoon? Hi Joleen! I’m afraid I didn’t write down which red wine I used for this recipe – sorry! And it was dark brown sugar that was packed. 😊 Hope you enjoy the recipe! I followed the recipe as you wrote it except for the Thyme. I’m not a fan. The only thing I added to the recipe after reading all the comments was the addition of the beef boulion cube. I needed to use an addition tsp of flour to the liquid to thinken it up to the consistancy I like. It was fabulous. Just in case anyone is curious I used a 2016 Cabernet Sauvignon named VIGILANCE from Red Hills Lake County.